Global Biofertilizers Market size was worth over USD 1.5 billion in 2016 and will exceed 1,200 kilo tons by 2024. 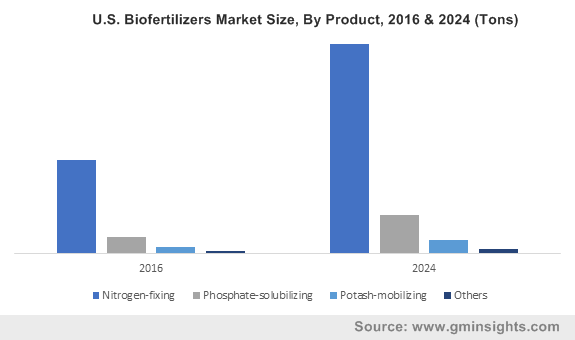 Increasing awareness pertaining to environmental concerns and health hazards from chemical fertilizers on crops & vegetation will propel biofertilizers market growth. Technological advancement in crop production along with shifting farmers’ preference towards sustainable farming will enhance the product demand. Need to improve crop productivity and yield per hectare to meet demand and supply gap are the key features enhancing the biofertilizers market growth. Increase in bio inputs consumption has significantly enhanced the land productivity. Annual increase in global average land productivity was 1.2% in 2016. Inclination towards organic farming due to increasing consumer health consciousness will support the product penetration. Global organic food industry was worth over USD 80 billion in 2016. Moreover, favorable government policies for promoting organic farming techniques and curb conventional fertilizers usage are the factors positively influencing the business trend. For instance, EU provides 30% subsidy on budget for farmers under “Common Agricultural Policy” to promote bio-based products. Reducing arable land along with need to minimize soil deterioration and avoid hazardous effects on soil and water will open new avenues for business growth. As per analysis, world loses arable land enough to produce 20 million ton grains per year. Enhancing plant growth, increasing nutritional value of soil and reducing harmful residues in land are the key properties encouraging product demand. Availability of synthetic fertilizers in low price along with lack of awareness among farmers may restrain industry growth. However, downward biofertilizers market price trend in the coming years will stimulate market penetration. Phosphate-solubilizing is the fastest growing product due to its essential properties in converting the insoluble form of phosphate into useful soluble form. Enhancing nutrient absorption rate in cereals, vegetables and cash crops will drive the product demand. Nitrogen-fixing market was worth over USD 1.1 billion in 2016. The products increase the soil fertility by converting the available nitrogen through nitrogen fixing organisms including blue green algae, rhizobium, azotobacter and azospirilium. Additionally, the production process also includes farm manure that increases the microbial concentration of soil enhancing plant productivity. Potash mobilizing market will witness growth over 10.5% up to 2024. High costs associated to production technique makes the product less acceptable among manufacturers. Technological advancement and innovations in production process are expected to reduce costs in upcoming years. Soil treatment application will witness growth over 11% by 2024. This growth is attributed to the key properties including improving soil fertility and enhancing crop yield per hectare. Moreover, increasing salinity level in soil due to excessive use of chemical fertilizers have resulted in increasing biofertilizers demand. Seed treatment was worth over USD 1.2 billion in 2016. The application is widely used due to its high efficiency and effectiveness. Adding nutritional value in seeds is the major advantage as it enhances plant growth in every stage of plant life. Cereals and grains dominated the industry and accounted for over 40% of the biofertilizers market share in 2016. Rising demand for high nutritional content grains contributing towards better health is the major factor fueling the industry growth. Fruits & vegetables are the fastest growing segment with CAGR over 12% up to 2024. Rising demand for organic fruits & vegetables will enhance the product penetration. High product benefits including retaining the nutritional value of soil are the fueling factors of the industry growth. Pulses & oil seeds market was worth over 150 million in 2016. Rhizobium, phosphorus solubilizing bacteria, vesicular arbuscular mycorrhiza, and rhizobacteria are the major ingredients used for the pulse production. Micronutrients present in the product, keeps soils biologically active and increase the water absorption for pulse production. Dry formulations accounted for over 70% of the industry share in 2016. Easy handling and transportation coupled with economical availability are the key factors boosting the product demand. Liquid biofertilizers market will witness growth around 12% by 2024, owing to added advantage including longer shelf life, easy storage and long term survival of microorganisms. Liquid formulations are relatively expensive due to added packaging cost. Asia Pacific is the fastest growing region with growth over 12% up to 2024. Shifting trends towards healthy lifestyle along with increasing consumer awareness about health & safety will drive the regional demand. Asia Pacific accounts for 40% of the global arable land. High product availability along with subsidized prices will drive the industry growth. Moreover, promotion of farming practices to reduce the hazardous chemical traces in soil & water will trigger the demand. North America accounted for more than 40% of the overall industry share in 2016. High disposable income coupled with increased consumer preference towards organic food are the key driving factors of the industry growth. Europe will witness gains over 12% up to 2024. Stringent regulations from organizations including EPA regarding optimum nitrogen level maintenance in soil & water will propel the industry growth. Increasing awareness pertaining to degradation of soil and prolonged chemical traces in soil and food due to chemical fertilizers usage has led to shifting preference towards biofertilizers. 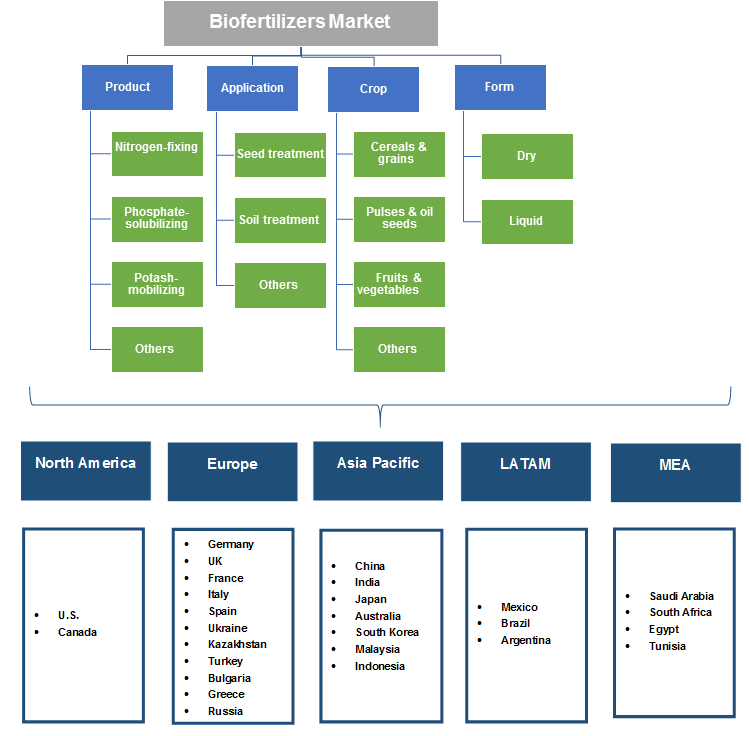 Global biofertilizers market share is fragmented, owing to the large number of regional producers. BF China Biofertilizers AG and Novozymes A/S are the major players. Other key players include AgriLife, Mapleton Agribiotec, Biomax, Labiofam S.A., Antibiotice S.A. and Symborg S.L. Major industry players rely on value chain distribution for better visibility of products and to gain higher profits. Expansion in developing countries along with supply agreements with retailers and major manufacturers are the key strategies adopted by the industry players. Biofertilizers belong to class of agrochemicals with major concentration of organic materials. Chemical fertilizers are increasingly avoided by the farmers to minimize the hazardous effects on environment and biodiversity. But, synthetic products are still the widely-used agrochemicals, due to its longer life and effectiveness. Potential applications in seed treatment, soil treatment, and root dipping are the key factors driving the industry demand. Efficient microorganism strains present in the product help plants and crops to absorb nutrients and minerals enhancing the plant growth. Growing population resulting in higher food demand resulted in necessity to maintain the soil fertility of soil. In addition to this, agrochemicals are helpful in reducing crop strain resulting in proper growth of crops. Food security regulations and frequent quality check of land regarding the maintenance of chemical concentration will propel the product demand. Rising human and animal health concerns and growing awareness among the farmers are majorly fueling demand in the overall bio inputs industry.